These prayers can be categorized into three loosely defined groups: Prayers 1-3 together, Prayer 4 as a unique Middle French prayer, and Prayers 5-7 together. The means by which these prayers travel together in other books will preface the discussion of each set of prayers. The focus of these prayers sits at the intersection of a broad trend towards Passion devotion during the fifteenth century and the chapel in which they were likely used. The Hargrett Hours Calendar is Use of Sainte-Chapelle, a chapel in Paris built in the thirteenth century to house holy relics collected by King Louis IX, among which were the Crown of Thorns and fragments of the Holy Cross (Bottineau 67). The Hargrett Hour’s devotional sequence brings to the reader’s mind the images of these relics. The rubrics accompanying these prayers offer an understanding of how this set of texts would have been used by its original owners. Rubrics are headings and, often, instructional texts written in red ink which preface many devotional texts, giving information on what the text was, how or when it was to be read or spoken, how one should be positioned during prayer, or what kind of indulgence is granted by the prayer. An examination of the rubricated texts that precede these prayers demonstrates how these short guidelines help shape the practice of prayer within a devotional sequence. What makes these prayers unique is their singular focus. Prayers in Books of Hours cover a myriad of topics, ranging from protection prayers to glorifications of Mary to petitions for mercy. The Hargrett Hours prayers, however, focus solely on the Passion. Three Passion-related themes emerge from these prayers: the Virgin Mary, Christ’s suffering, and the eternal reign of Christ and redemption that is possible because of the Passion. In this particular prayer, there is an acknowledgement of Christ’s suffering due to his love for humankind, in addition to a plea that he not forget the earth, again asking for compassion from Christ while reflecting on His suffering. This plea for compassion wedded with a reflection of Christ’s suffering is characteristic of the Passion prayers, including those found in the Hargrett Hours. This singular focus on the Passion lends credence to the theory that these prayers are related to Sainte-Chapelle of Paris, constructed in the 1240s to house the many relics of Louis IX (Bottineau 68). Louis IX established two specific celebrations that venerate the Passion: a celebration of the Holy Crown (or the Crown of Thorns in French) on August 11 and the Exaltation of the Cross on September 14, both of which can be found in the Hargrett Hours calendar. These feasts correspond to the unique relics housed in Sainte-Chapelle, which included, among others, a piece of the True Cross, some of the blood of Christ, and most notably, the Crown of Thorns (Bottineau 67). Relics differ from images or other representations, as they rather are “an actual physical embodiment of [divine presence]” (Walsham 12). More than simply physical objects, relics provided a tangible link to saints (like the Head of John the Baptist) or Jesus (the Shroud of Turin). Relics played a devotional role in the lives of medieval worshippers. They formed a connection between mankind, the saints, and the Holy Trinity and tangibly demonstrated how different cultures shaped their physical worlds to their own values (Walsham 10). In Barbara Boehm’s description of this phenomenon, the relics rival the sacraments in medieval believers’ spiritual lives and stems from the Catholic belief in the power of saints to advocate for humankind to heaven (Boehm, “Relics”). Perhaps most important is the power relics hold: in the words of Walsham, they “operate as a locus and conduit of power” (13). Of course, these Eucharist and Passion relics become complicated by the Assumption of Mary and Ascension of Jesus. If both Mary and Jesus were bodily assumed into heaven, how can their relics remain on earth? Walsham notes in her work on relics, however, that this did not “restrict the contemporary appetite for sacred objects connected with them [Mary and Jesus]. Secondary relics of the Virgin and the Passion—maternal milk, the crown of thorns, splinters of the Cross, and drops of the Saviour’s blood—proliferated” (Walsham 21). Bynum also covers this issue in her Wonderful Blood (2007) in which she describes this debate as “the paradox of presence and absence” (86). This has led to the concept of the Host as a relic itself, primarily because of the Catholic belief in transubstantiation, or the belief that the consecrated bread of the Eucharist is transformed into Jesus’s body. Bynum explains that thirteenth century audiences began to prioritize reverence of the Host even more, as she notes that “we find stories of people attending mass only for the moment of elevation, racing from church to church to see as many consecrations as possible and shouting at the priest to hold the host up higher” (87). This was in response to a liturgical move towards veiling the Eucharist during the consecration. We grouped Prayers 1 (“Crucem tuam adoramus”), 2 (“Deus qui manus”), and 3 (“Deus qui voluisti”) together because of their shared focus on the Crown of Thorns. However, these prayers are interesting because, as much as they can be grouped together thematically, they do not seem to travel together. Of the 217 manuscripts surveyed for Hargrett Hours’ prayers, there were no identifiable instances of Prayer 1 and only three contain both Prayers 2 and 3. Therefore, we conclude that these prayers were specifically chosen by the compiler of this Book of Hours to be placed together specifically for their Passion focus. Prayers 2 (“Deus qui manus”) and 3 (“Deus qui voluisti”) exist as separate prayers about the Passion, but are typically found as part of other prayer groupings: thirteen out of sixteen occurrences of Prayer 2 appear after the Gospel of John’s Passion, and ten within a devotional sequence containing one or more of Hargrett Hours’ Elevation prayers. Prayer 3 appears twelve times in the survey, eight out of twelve within devotional sequences containing one or more of Hargrett Hours’ Elevation prayers. How these prayers relate to the Passion is also of interest because of their shared common denominator. All three prayers in this grouping refer to the “spinis coronari” or “coronam spinam,” both of which are terms for the Crown of Thorns. Prayer 1 (“Crucem”) directly mentions the “spinis coronari” amongst other generic Passion material. The prayer asks the Holy Spirit — “O trinitas sanctissima”– for the pardoning of the speaker’s sins and for life after death (“…omnium remissionem peccatorum et post morte michi et oribus parentibus et benefactoribus meis vitam et gloriam sempiternam”). These petitions are placed within the context of describing the “spinis coronari” and other Passion material, like Jesus’s death and resurrection after three days. Of particular interest, Prayer 1 remains unattested in any of the 217 Books of Hours included in our manuscript survey, implying that it was specifically created for the Hargrett Hours. Prayer 2 (“…manus”) begins with a rubric, “Orison selon la passion nostres” (“a prayer according to our passion”), which introduces this prayer as necessarily discussing the passion. Note as well that the passion uses “nostres” (“our”) rather than “tuos” or “suos” for “your” or “his” passion. This specific change in usage gives the impression that the Passion is not just Christ’s passion, but also belongs to the speaker of the prayer, and draws the speaker into the prayer as part of the Passion scene themselves. This prayer also mentions the Crown of Thorns like the previous prayer. Prayer 2 features an intense focus on Christ’s wounds and blood, his sacred body, and his five wounds: “Deus qui manus tua et pedes tuos et totum corpus tuum pro nobis peccatoribus in ligno crucis posuisti Et coronam spinam a judeis in despectu tui sacratissimi corporis super caput tuum impositam sustinuisti et quinque vulnera passus suisti atque in sanguine tuo redemisti…” (“God, you who were able to sacrifice your hands and your feet and your whole body for our hearts on the wooden cross, and who endured the Crown of Thorns placed above your head by Judas in contempt of your most sacred body and also having suffered injuries and through your blood you redeemed us.”) This focus evokes a reverence for the suffering of Christ as it is through Christ’s spilled blood and broken body that salvation is possible for the sinner. In addition, this prayer shifts from a focus on the wounded body of Christ to a request for virtues and knowledge, further establishing the idea that Christ’s wounds are the means for redemption. Prayer 3 (“…voluisti”) continues the trend towards the Passion in conjunction with the Crown of Thorns, with a rubric titling it “Autre orison de la passion” (“Another prayer of the Passion”) and a mention of the “spinis coronari.” Prayer 3 further describes the Passion story, including people and actions: “Ante conspectum Anne et Caiphe Pilati et Herodis indecenter oferri flagellis et opprobrus vexari spinis coronari…” (“…and to be most shamefully treated before Annas and Caiphas, Pilate and Herod; to be accused by false witnesses, to be tormented with scourging and revilings”). This creates a narrative for the story of the crucifixion within the prayer to parallel that found in the gospels. It is clear that these three prayers can be grouped together primarily from (a) the focus on Passion devotion and (b) the focus on the relic of the Crown of Thorns as part of that Passion devotion. Furthermore, the combination of the unattested Prayer 1 (“Crucem”) with the cherry-picked Prayers 2 and 3 (“manus” and “voluisti”) into a brand new grouping of prayers indicates a firm decision to associate these prayers both together and with the Passion, and further strengthens the grouping’s association with Sainte-Chapelle. In the same stylization as the first three prayers, the speaker in Prayer 4 addresses Christ directly, praising Him for His “trèsgrant charité” (great charitable act), meaning, of course, His sacrifice on the cross. In order to have a better understanding of the context and possible uniqueness of this text (as we have yet to find this prayer in any other manuscript), we read through the index that Victor Leroquais created in 1927 of French prayers in Books of Hours held at the Bibliothèque nationale de France. Interestingly, only two of the French prayers in Leroquais’s index are addressed to directly to Christ. These include the “Prière pour l’élévation,”, found in the Heures de Macé Prestesaille (Paris, Bibliothèque nationale de France, MS lat. 1179, f. 150v) (Leroquais 322) and the early fifteenth century “Prière à Jésus-Christ” (from Paris, Bibliothèque nationale de France, MS lat. 1161, f. 1r) (Leroquais 323-324), but neither of these prayers go into the same graphic description of the Crucifixion as the Hargrett Hours’ French prayer. Thus, Hargrett Hours’ Prayer 4 is unique not only in the sense that it hasn’t been located in any other manuscript but also because of its especially distressed, emotive, and physical depiction of the Passion. A major linguistic question is why the manuscript would contain only one French prayer while the other six are in Latin. During the late Middle Ages, French was gradually displacing Latin (Reinburg 2), and Books of Hours post-fifteenth century usually featured some French texts (Reinburg 96). There may not be a viable explanation as to why only one prayer would be in the vernacular, but Hargrett Hours’ social context reveals that it was not necessarily unexpected to find a Book of Hours from this period with a mixture of the two languages, and the amount of each that was included was highly variable. 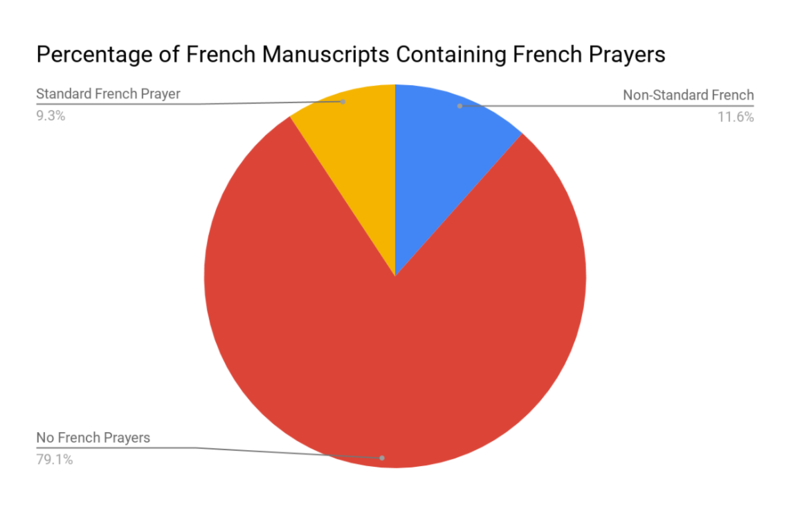 Out of a survey of forty-three French Books of Hours culled from the 2017-18 data set of 217 horae, 79.1% (thirty-four Books) did not contain a prayer in French at all, as can be seen in Figure 1. 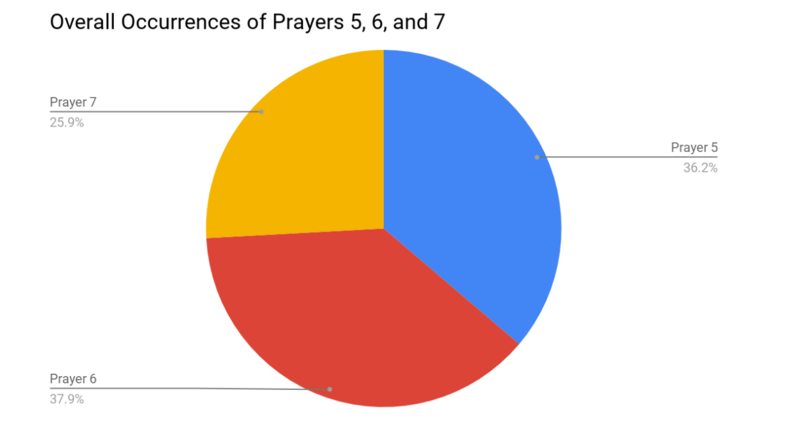 The remaining 20.9% (nine Books) are made up of books that did include French prayers–11.6% (five) were non-standard French prayers and 9.3% (four) contained “standard” prayers (which, for our purposes, we have defined as a prayer or set of prayers that commonly serves as an accessory text in Books in Hours, such as the Fifteen Gradual Psalms, the Joys of the Virgin, or the Requests of the Lord, with either a set script or structure). Furthermore, the French prayer located in the Hargrett Hours cannot be matched to any existing French prayer in the forty-three surveyed French Books of Hours or to any of the eighteen prayers in Leroquais’ index, and its especial emphasis on the emotive depiction of the Crucifixion makes it unique among other French prayers in Books of Hours, even if the fact that it is written in French does not. Prayers 5 (“Anima xpisti sanctifica me”), 6 (“Domine ihesu xpisti qui…”), and 7 (“Ave domine iheus xpiste”) follow Prayer 4 as a much more codified cluster than the first three prayers. Of the 217 manuscripts surveyed, forty-three contain one or more of Hargrett Hours’ prayers, and of those forty-three manuscripts, thirty-two have Prayers 5, 6, 7, or a combination thereof (Figure 2). Within that subgroup, ten contain 5, 6, and 7 together in a devotional sequence, though not in sequential order as in the Hargrett Hours (Figure 3). 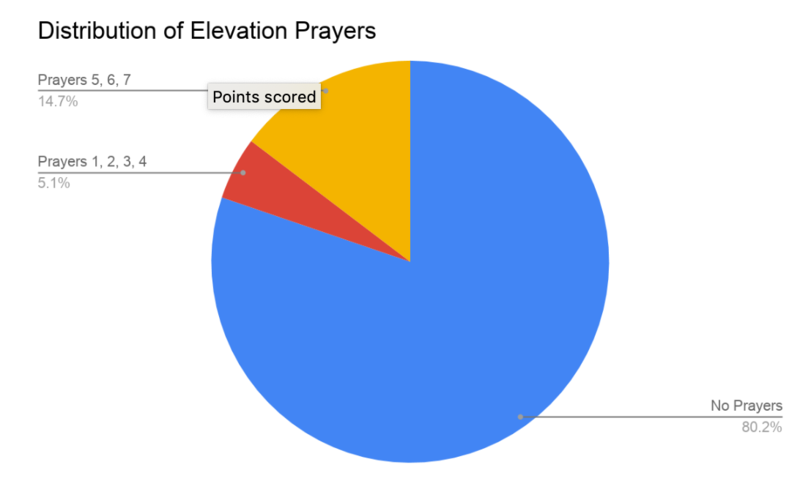 The prominence of this unit speaks to the rise in popularity of Elevation prayers. Prayer 5 (“Anima”) travels as part of this group, and can be identified as an Elevation Prayer. Elevation Prayers come from the practice of reading individualized prayers in the vernacular from a Book of Hours while the priest said mass in Latin. Therefore, at least one prayer would be specifically “designed to be said at the elevation of the host” (Reinburg 192). Simply labeled as “Orioson” (“Prayer”), it takes reading this prayer and further research to identify it as an Elevation prayer. This prayer highlights the Blood of Christ as an object of comfort, as the speaker literally asks for “…Sanguis xpisti inebria me. Aqua lateris xpi laua me. Passio xpisti conforta me” (“…Blood of Christ, inebriate me. Water from the side of Christ, wash me. Passion of Christ, strengthen me.”). The author is “intoxicated” by the blood of Christ and wants to be washed with the water from the side of Christ. These words and structure fit with the concept of the Elevation Prayer due to the belief in the Eucharist as a relic. Prayer 6 (“Domine”) has been termed the “Boniface prayer,” from the rubric that states “Boniface pape a ottroyé à tous ceulx qui diront ceste oroison ___ ans de vray pardon” (“Pope Boniface has said that those who say this prayer will earn [blank space in the manuscript] years of pardon”). The rubric identifies this prayer as an indulgence prayer from Pope Boniface, the same pope who canonized Louis IX. Prayer 7 (“Ave domine”) has a rubric that notes this prayer as an “Oroison moult devote à nostre seigneur” (“Prayer of great devotion to our Lord”). It focuses on Christ as the son of Mary, who is specifically referred to as “Ave domine jhesu xpiste verbum patris filius virginis” (“Hail Lord Jesus Christ, Word of the Father, Son of the Virgin…”) at the start of the prayer. Further, the prayer focuses on Mary and her view of Christ’s suffering, which indicates its structure as a lamentation prayer which typically focused on the wounds, suffering, and pain of Christ. According to Margaret Manion, lamentation prayers originated in France, and “may be associated with the growing importance paid to the relics of the Passion housed at the Sainte Chapelle” (38). The Passion material found in these prayers also crosses the boundaries of these clusters. This material seems to correlate to the three elements of Passion devotion mentioned earlier: the Virgin Mary, Christ’s suffering, and the eternal reign of Christ and redemption that is possible because of the Passion. The Virgin Mary is mentioned in prayers 1, 6, and 7 as a recurring theme in the Passion. This is due to her sympathy and pain at the suffering of Christ. Medieval Europeans were devoted to the “Sorrows of Mary”– her grief at the suffering of her Son, which the medieval devout would share in as a religious experience (Duffy 259). John 19:25-27 has Mary standing weeping under the cross as her Son dies. In prayers 1, 6, and 7, Mary is venerated as the mother of God while the author of the prayers details the suffering of Jesus, likely to juxtapose Mary with Jesus’s suffering and emphasize the fact that she suffered alongside Him. Prayers 2, 3, 5, and 6 transition from description of Jesus’s suffering to acknowledging Jesus’s reign in Heaven for all eternity. In addition, all of the prayers mention redemption; a few of the prayers vocalize the speaker’s desire to join Jesus’s reign in Heaven. Prayers 1, 2, and 3 end by mentioning how Jesus was crucified and joined the Father and the Holy Spirit for all of eternity. Prayer 5, being a source of comfort through the wounds of Christ, is more a plea of deliverance from evil, otherwise called a protection prayer. The prayer is begging Jesus to save the sinful soul and set the reader beside Jesus with the angels in Heaven. The entire book of Hours, from the specific Sainte-Chapelle feast days, to the Long Hours of the Passion, to the inclusion of the Passion gospel and the Passion-related prayers, points to Sainte-Chapelle and the Passion of Christ. This book is unique because of its overwhelming inclusion of Passion devotion material, and its connection to Sainte-Chapelle reinforces this idea. Boehm, Barbara Drake. “Relics and Reliquaries in Medieval Christianity” The Met’s Heilbrunn Timeline of Art History, accessed 4 December 2018, last updated April 2011. www.metmuseum.org/toah/hd/relc/hd_relc.htm. Bottineau, Yves. Notre-Dame De Paris and the Sainte-Chapelle. Rand McNally, 1967. Bynum, Caroline Walker. Wonderful Blood. University of Pennsylvania Press, 2007. Duffy, Eamon. The Stripping of the Altars: Traditional Religion in England c. 1400- c. 1500. Yale University, 1992. Leniaud, Jean-Michel, and Françoise Perrot. La Sainte Chapelle. Nathan/CNMHS, 1991. Leroquais, Abbe V. Les Libres D’Heures: Manuscrits De La Bibliothèque Nationale. II, Bibliothèque Nationale , 1927. Manion, Margaret M., and Bernard James. Muir. The Art of the Book: Its Place in Medieval Worship. University of Exeter Press, 2006. Reinburg, Virginia. French Books of Hours: Making an Archive of Prayer, c.1400–1600. Cambridge University Press, 2012. Walsham, Alexandra. “Introduction: Relics and Remains.” Past & Present, vol. 2016, no. 5, 1 Jan 2010, pp. 9-36. https://doi.org/10.1093/pastj/gtq026.